Up to now, it was difficult to find a sheet metal fabricator that would service the retail customer. Did you ever need a piece of sheet metal that meets your specifications in size and shape, and do you - like most of us - don’t have the tools to cut and shape the metal sheet? 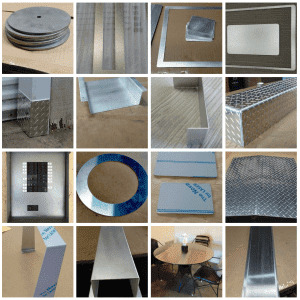 Then you will be pleased to read that there is a sheet metal fabricator that will service your retail customer requirements without forcing you to buy more than what you need in size and in quantity. Order online exactly what you need, no more or less. Yes, it is an internet-based laser cutting service that allows you to buy just one piece (if that is what you want) and they will ship it throughout the United States. MetalsCut4U has simplified the way you can order your individual sheet metal part by answering 4 easy questions and clicking on the options available. You do not have to know any specific details about the sheet metal itself. MetalsCut4U even tried not to use any technical terms, which makes the website even more attractive. Actually, the beauty of the website is that it is so easy to use that everybody can order a sheet metal part in the size and shape required. 3 - 4 different levels of thicknesses. MetalsCut4U offers these specific metals based on their many years of experience, and they realize the metal will be used in a retail, semi-professional environment, where the need for one-offs and specific sizes is key. But even if you need something different from a sheet metal thickness or type perspective, you can always get in contact with MetalsCut4U by writing them a short email or clicking on the individual request button they have on the website. Now that you have chosen the metal, the surface and the thickness it is time to select the shape you need. MetalsCut4U offers 14 different shapes you can chose from - directly on the website. After choosing the shape, you will be asked to enter the measurements. And based on the shape you have chosen, you will be asked to enter between 1 - 6 different measurements. The most common shapes are a rectangle, circle, divided circle, triangle, angle, box or tray, u-channel, z-channel, etc. Each shape is defined and will be displayed with a picture and matching fields to enter your exact measurements. The unit of measure asked for is in inches. You can enter them in decimal or in fractions as you please. 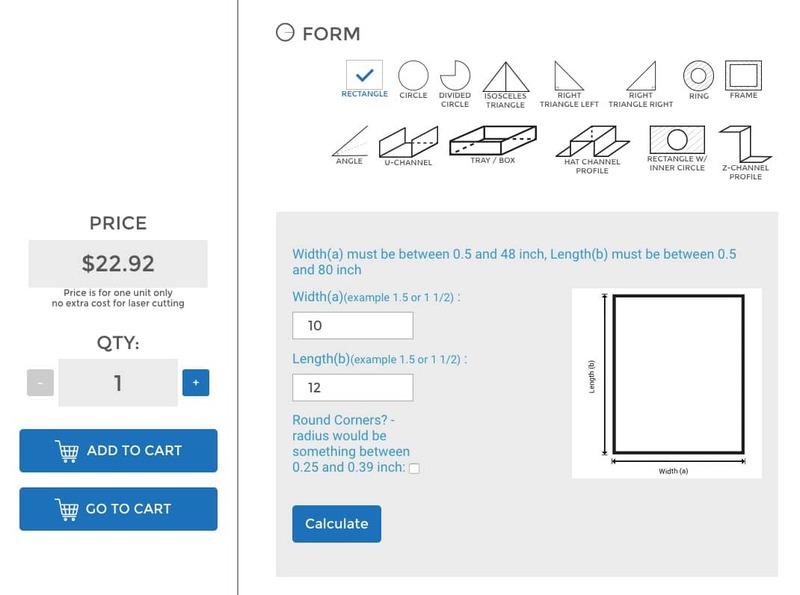 After you have entered the measurements for your DIY metal project, press calculate and get an instantly a displayed price displayed, which will show you the cost for the individual sheet metal part you have just configured online. The blue button called “calculate” will only show up if you entered every measurement within the rules that may apply. Therefore you will not be able to order something that MetalsCut4U can’t cut, bend and weld for you. So now that you have the price for the metal part, the next steps are to place the item into the shopping cart and enter the billing information like on any other website you have ordered from. Now, one more thing you should consider. Once the order is placed, MetalsCut4U will start to fabricate your individual part. 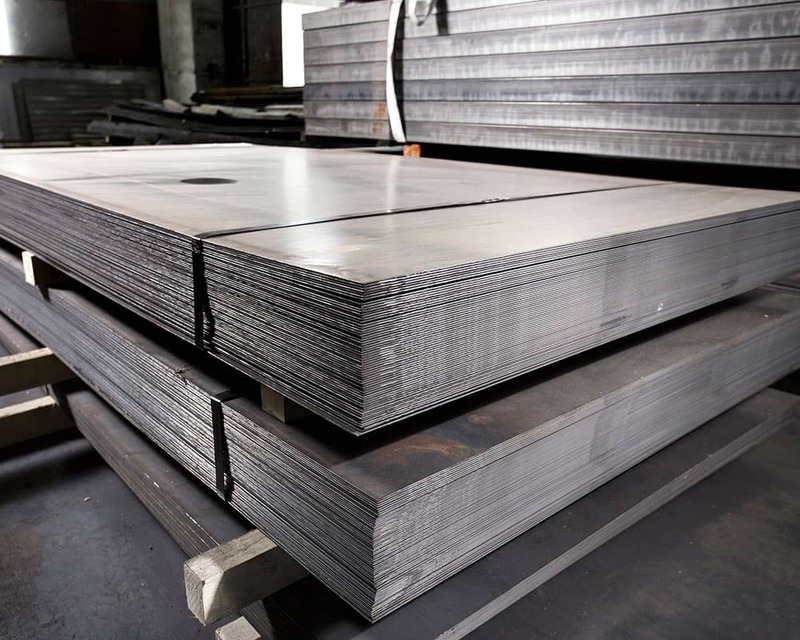 In other words, there is nothing sitting on a shelf ready to be shipped: there are only large pieces of sheet metal made of stainless steel, aluminum or mild steel waiting to be cut and shaped. This also means you will most likely have to wait a few days until you can get a hold of your sheet metal part. MetalsCut4U has a short lead time of 8 - 10 days for fabrication. Once the part is ready to ship you will get an email giving you the tracking number for your package. Let’s say you have a totally different idea of how your sheet metal part should look like. No problem! Send MetalsCut4U an email attaching a drawing where you explain what you would like to have, and don’t forget to mention the sheet metal specifications and the measurements. The experts from MetalsCut4U will have a look at your drawing and if they can fabricate it, they will send you a free quote. Try it today. It is just that easy.